My stay at RafJam’s was a much needed break from fast-paced Kingston. The three nights I spent there were exactly enough to get me recentered and feed my spirit. The room was beautiful and comfortable. Best sleep I had my whole trip. The backyard is breathtaking. Swim in the water, drink from the stream. The food was all delicious and the staff was really sweet. WiFi was mostly off, but it was nice to disconnect for a bit. I’ll be back someday. Thank you for everything! This is a really great hostel. The closest you can get to mother nature. 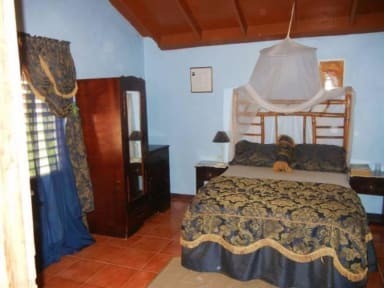 The surroundings are really pretty.The facilities are maintained clean and professional. I have some tips to make your stay memorable here: 1)Do not drive on your own. The hostel offers pickup services from multiple locations. I highly recommend you use that. The road and parking situation are bad unless you are a pro-driver. 2) The dinner portions are very small. Make arrangements accordingly. 3)Get a mosquito repellent. I loved this place. The setting in a valley between the mountains with a garden of flowers, hummingbirds and even a little waterfall. The staff were excellent, any question they answered, any concern they would offer help. The road up the Blue Mountains is narrow with potholes but it is fine. When you turn down the dirt track though it is quite bumpy and you don't know how far you have to go. I was a little worried in my Toyota Corolla!!! Great place to stay for some time off in a remote location in the mountains. Only thing is to make it from the main road to the property if you have a rental car as the path is extremely bumpy. The location and our room were perfect. A beautiful garden and facilities very clean. The evening meal however was catastrophic (we had to wait several hours for our meal because it was given to other clients instead and then there was nothing left for us) and the breakfast was very basic.